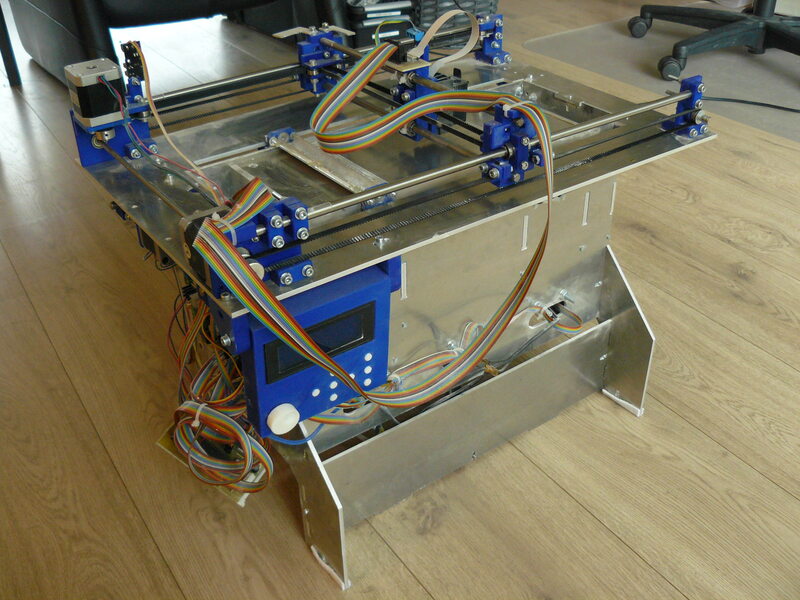 Plan B is an open source 3DP 3D printer, printing in powder with a special binder. It is made with ordinary 3D printer parts, of the shelf inkjet technology and a Laser or Water cut aluminum frame. It has a resolution of 96DPI (roughly 0.26mm per dot) and costs around €1000,- to make. 3DP printing looks a lot like ordinary inkjet printing, the only difference being the third dimension. It uses a special powder stored in several hoppers and binder stored in either the cartridge or a separate tank. First the printer adds a thin layer of fresh powder on a special bed (buildbed) that can lower. A inkjet head prints thin cross sections of a 3D model in the powder with binder. When a layer is done, the buildbed lowers by a fraction and a new layer is deposited. Then the process is repeated until the part is complete. After printing the 3D printed parts need to be carefully depowdered. This is a delicate procedure, since the part is only lightly bound yet. To prevent damage on the part, air is used to blow the part clean. Most parts require post processing in the form of infusing with CA glue or epoxy, or firing in a kiln. Only after this will the parts reach their final strength. 3DP offers a few unique materials and options for 3D printing. 3DP can print in almost any material that can be supplied as a powder. Thin walls and rods are weak and might break during cleaning. Plan B is currently only capable of 3D printing in gypsum that is used by Zcorp printers without colors. Experiments are on the way to expand the list of materials with ceramics and graphite powders. Also an effort is going to be made to make the current material more open source friendly. there aren’t very many companies selling this powder, and even less selling it for decent prices. Plan B has several improvements over Focus. The frame can be manufactured on a lasercutter or a flowjet. The instructions on building Plan B are way too big to fit on just one page. Click the button to go to the full assembly and use instructions. Here you will find what you will need, how to configure Plan B, how to modify cartridges and how to print with Plan B. Information on these pages may change or new pages with new information may appear, so check back every once in a while. Thank you for your work, you made a really good project! If you have time, can you answer me a couple of questions about Plan B? I’m not a good programmer, not even an electrician, but now I’m working with the Plan B printer and I need to make some changes to the design of the project. I have a “xaar128” printhead, and I need to make sure they are compatible. So the question is: are they compatible? In addition, I have followed all of your instructions about “print.txt”, but I’m not sure that I did it correctly. Can you send me a simple example of “print.txt” to my email address? Probably, my question is to simple, but your opinion is important to me! Thank you for a great job! I know it has been asked before but it’s been awhile. Have you had any progress using sand yet? I want to make my own cylinder heads dohc for Chevrolet. I will happily contribute for this possibility. How much harder would it be to use 2 cartridges with two materials? I had an idea of using this work here to build a diy polyjet 3d printer where the cartridges deposit resin which is cured by a UV light connected to the x carriage. No powder would be used in this method so a supports material is required, resin deposited through these nozzles can’t stop in mid-air for overhangs (even small distances) so a solid support material is required. I thought of using water-soluble UV resin for the supports and regular UV resin (ignoring the fact that either is too viscous for the inkhead). I am designing and testing the PlanB,and i use the firmware is Megatronics,the Circuit board is Inkshield ,the Ink cartridge is HP C6602A. Now I plan to ink ejection, but cartridge soon burn out, has broken six cartridge the, and nozzle is gradually broken, after the bad I to nozzle testing resistor burnout, found resistance value is infinite, the normal should be tens of ohms. The range of the ink jet control voltage is 19.5V-20V;My ink jet pulse width is 3-5us. I began to suspect that motor pulse interrupt interference inkjet, behind I only ink jet motor real, cartridge nozzle will burn out, but little, chairman of the working time? There will be a problem not Inkshield hardware, such as the current is too high, resulting in the cartridge is burnt out? I want to ask you ever had burned cartridge, and help me analysis produced the reason, I am very anxious, I hope to get your answer. The inkshield can impossibly produce too much current. The nozzle has a set resistance, and at 20V, the current simply cannot be too high. The problem is most likely in the interrupt. If the Megatronics interrupts while the nozzle is firing, it will fail. In Plan B i did not use a single interrupt. I am testing the Plan B, and I use the firmware is Megatronics V3. All axes are well working ,but when printing from the SD, the Plan B is not work. I think that the Plan B can not read the file data from SD. Or the softwear maybe has some wrong things? Is there anything preventing the build area to be scaled up? I very interested in your project, but I would need a larger build area for it to be feasible (I don’t mind re-engineering a larger version). Also, are you selling the control boards? Thanks! In principle there is nothing stopping you. It really depends on just how big you will need it. A 20x20xm bed requires less and different modifications than a 50×50 bed. The controller should be able to handle it, though some minor modifications might be needed to the firmware. I have nothing for sale at this moment. I discontinued work on Plan B and am now working on something new. The coordinates are stored in integers, which only support up to 32k point in positive and negative. With a resolution of 0.01mm, this gives 320mm of total travel. If more is required, the integers need to be replaced with longs, capable of storing an for all intents and purposes infinite value. Go to the forum. Under 3DP is the current development. Is it possible to use ABS powder with acetone as binder ? Acetone is commonly used to stick together 3D printed parts in ABS, it should works or there are technical / legal difficulties with that idea ? And dichloromethane as binder with PLA powder ? 1. All wetted components need to be able to withstand the solvent. Acetone is incredibly aggressive to many glues, sealants and plastics. Dichloromethane I know too little of. If the printhead (the main wetted component) can deal with it, it should be doable. 2. Something needs to prevent the solvent from spreading too far in the powder. It should only be where the drop hits, and not spread out. The effects of this would have to be experimented with. I do not know of any legal difficulties doing it. Only once you start doing things commercially do you need to worry about legality. How difficult it will be to replace the cartridge printing head control with a stepper motor controller, I am trying to work on a different powder and I want to use a peristaltic pump instead of this printing head. I am not a IT person so i have no idea about this. Not as difficult as it could have been. I can’t look it up now, but the firmware should support low level standard gcode. This is for old testing purposes where I only trigger a single nozzle while doing movements like an FDM printer. The same basic motion you are trying to make. Short answer: Possible, not extremely difficult with programming knowledge but also not plug and play. Can you guide me towards the particular ino files in which i have to look into. I love this design. Working at a university, we have a lot of different printers including powder bed binder jet printers. But all of them are too big. We have tiny amounts of powder and would love to build an open design printer with a very small, potentially exchangeable build box for materials development. Is there a possibility to reduce the build box size to 20x20x20 mm³ or even smaller? The electronics and hardware can support sizes that small, but a printer that small would be a complete redesign. I should be possible. I have quite a lot running at the moment. I can assist with any questions, but I am not able to help in any way with a design. Hi, I am wondering what kind 3D printer you used to print the PLA parts? Some parts require high accuracy to mate with other parts. While most commercial 3D printers are not that accurate nowadays. You should try Drystone plaster. I have had good luck with it using ZB60 binder. Looking forward to watching your progress. I just wanted to say excellent work and thank you, I have followed your projects for some time. I also wanted to update that I will have a plan-b built within weeks for some open search research for my thesis project. Again thanks for your efforts. Hello, It should in principle have been possible, if there wasn’t a printhead that also needs to be connected. I see no spare pins on the Rumba to connect this. Apart from that everything is there. So in short, sadly, No. Oh that’s a shame, just one more question, can I use the inkshield straight up instead of making the circuit you have? Thanks so much for your help! If you are handy with a breadboard you can either wire an Inkshield to a Megatronics, or even duplicate the circuit your own, but it was designed as a shield, so you’ll have to do a bit of creative wiring to get it to work. Thanks so much for all your help, I’ll wire up the ink shield then, I was just reading into the rumba board and it looks like there is a breakout with spare pins, I could use those for the print head right? The firmware needs to be modified when it uses other pins, the pins used are in order, so they require very little processing power to be used. This being said, with minor modifications to the firmware (and sacrificing a little bit of speed), other pins could also be used. I’ll see if I can modify the firmware, hopefully I’ll be able to do it, thanks a million for all your help! Hi, we want to build a PlanB. In stead of the carriage, we want to add a laser. Do you think the Megatronics board is able to control the laser driver, which basically requires PWM input? Thank you! I don’t know about that. There are PWM pins available on the Megatronics, but I know nothing of your laser. What kinds of powers does it use, how is the PWM supplied, as 5V, as 12V, as 24V. This is the laser we want to use. It has a specialized driver. Basically, as long as the the voltage of control signal is above 2.8V, the laser can work. I did some checking but I had some issues. 1. It might be better to use different firmware for a laser cutter. Plan B firmware is only really written for inkjet printing, and so, normal Gcode will look rough. Use a normal piece of firmware, like firmware, or something modified, like lazrfish. 2. I can’t find an open PWM pin on the Megatronics that is easily accessible. The best thing I found was a 12V power output that is on a PWM (that supplies voltage the wrong way). You might need to do some hacking on the megatronics to get to a PWM compatible pin. Other than that, the hardware shouldn’t have to stop you. Only the firmware and controller that require some extra thought. Thank you a lot for your advice. We build PlanB mainly for research on control, I guess the firmware can be somehow solved as long as the hardware works. A remain hardware problem can be how to add an inert gas chamber on PlanB, do you have any advice on that? Thank you! The hardware shouldn’t be the limit, and if it is, there is always room for modification. There are many ways for an inert gas chamber, but since the frame of Plan B was not designed to be airtight, my advice would be get a big (preferably see through) plastic storage container big enough to house Plan B completely. Place Plan B in it, drill holes for wires and tubes, and print everything in there. It might be an idea to get the screen and keypad outside of the container. Really impressive work that you have done there. I am interested in building something to make foundry patterns. I am thinking making something similar for printing foundry sand like Soligen, ExOne or EOS. If not, I will use another material that I can use to cast urethane. At this stage I am investigating sand materials and binders and whether it must be sintered or glued. Speed is also a concern so I am investigating the possiblity to have multiple printing heads. I have a CNC machine shop, if you need any hardware made, I will help if I can. In theory, it should be possible to make foundry patterns with Plan B, but it is quite small (150x150mm). Doing it with binder should be enough, but additional steps to harden the mold may be necessary (I do not know at this point). To my knowledge, ExOne use binder. On the topic of speed, Plan B is going to receive a controller upgrade. It should be possible to speed up Plan B to 150mm/s (2,5x as fast as now) and printing in 2 directions, but all without prejudice for now. I’m really excited to get started and want to know if anyone out there built the Plan B yet and what they think of it. I know of a few people who are working on one, but I haven’t heard of anyone finishing one. That means that either: A. No one has finished one yet, or B. People have finished one and had no problems with one (because if they had, I would have known). I do need to remind anyone wanting to build one that Plan B is an experimental platform that can 3DP print, not a fully completed, easy to use 3D printer. You will need to have quite some technical know how and preferably some 3D printing knowledge to build one. Thanks for the quick response. I’ll be sure to keep you posted. I’m extremely excited about the Plan B and want to get started making one myself. However, I’ve been looking around and haven’t seen anyone mention their Plan B’s that they built. Are there people out there that made Plan B’s and are happy with its functionality? Your Plan B printer appears to work in a similar way to the commercial ExOne printers that are used to print moulds for sand casting in metal. There are videos which show moulds produced on their machines being bolted up tight, so obviously they are very strong straight from the printer. Is it the “ink” that they use that is different that provides the strength, and could Plan B be used with different materials, sand rather than gypsum, and an alternative ink. You are correct that there are plenty of 3D powder printers on the market that actually perform a lot better than Plan B. What the ExOne can do is actually one of the things I also want to achieve. Most of this is due to the powder and binder used, all Plan B really doesn’t have is speed and accuracy (and maybe a properly heated buildbox). There is nothing stopping it from printing in these materials. I do however think that it is still mostly the powder. In most printers the binder is actually quite inert, because it has to be channelled though ultra thin canals and holes. By using secret additions to the powders (and some additions to the binder) these companies do indeed manage to make great thins. I couldn’t tell you what it is though. I am pretty close to picking up where I left with Plan B, and making more improvements and starting with new powders, so Casting sand might actually be on the list. Could PlanB directly use just molten wax, without powder, for printing? Could flour be used for cheap prototype printing? 🙂 Or sugar, or any available powder on the market? Printing directly in wax is not possible with the hardware. The cartridges used are made for cold, inert and fluid liquids, not molten thick(ish) liquids. The prinhead will most likely clog. That is not to say that it isn’t possible at all. 3D printers printing in wax directly have existed for a long time. Wax powder should be possible on plan B though. Flour would probably be a viable printing material, it is cheap and very fine. Sugar is confirmed to be possible on 3DP. Cheap commercial powders are not available, but there are plenty of recipes that are cheaper than $5/kg. All you need is a base powder and a binding powder. Several binder powders have been suggested, like PVA, Maltodextrine and meringue powder. For the base powder the sky is the limit. Thank you and outstanding work. 1.) in the BOM on page 3/5, you call out for T2.5 timing belt (1.8m) & (2.4m). In the # column, you have 1,8, 2,4 and 2,4 . Am I correct in believing that you are calling out 1.8m and 2.4 m of belt total? 2.) in the BOM on page 5/5, you call out the Megatronics V3 control board. Are you using any special parts of the V3 board? OR will V2 work? 1.) The timing belts are indeed the total lengths required. 6.6m total is what you will need for all timing belts combined. 2.) There is nothing specific used on the V3 that isn’t on the V2, but someone decided that the V3 would have completely different pin mapping. The firmware needs to be modified to run on V2, a quite extensive process I also did when I went from V2 to V3. So the answer, a V2 would work, but modification is required for that. would you please help me about the user interface electronics?is there any pcbs for it???? The LCD is a 4×20 HD44780 compatible LCD screen. Both simply hook up to megatronics with the LCD header and keypad header, no additional circuits required. If you have more specific information on your problem I can give more help. Can you describe the process by which a printed part can be infused with epoxy or resin to make a workable part (if at all). For example, if I were to print a part that is meant to part of a machine (say a gear), what is the process to make it durable enough to be put into service. I can imagine creating molds out of simple parts for injection molding, or for casting, but a complex part may not be so. This is probably the best OpenSource project in quality I have ever seen. From an easy to read web site over great and professional plans to – as far as I can tell – complete and detailed documentation. Well, you have a follower now. I just ordered the aluminum frame from CutWorks. Tomorrow I will order the remaining parts. Looking forward to assembling and testing. In my old printer, that had the tubes going to it had 1 printhead. cyan yellow and magenta, it was all in a 1.5 centimetre space. Do you have the type number of that printer? Not at the moment, i may be able to get it to you in 4-5 days time. It fits four colors in the space of a BC-21 cartridge which was used by the first Z-Corp printers. For a 3D printer, you will be changing the little ink tanks all the time. True color 3D printing requires at least 5 colors. Epson makes some great heads that would last long enough. They are probably 7 to 9 cm wide. Will you ever put down some designs that will have it support colour too? I will, but colour will take a full redesign of just about everything. If I do it it will probably be in a completely new printer. Couldn’t you just add another printhead with rgb on it, or does it take more than that? There aren’t any RGB (it would actually be Cyan, Magenta and Yellow) cartridges for full colour for the C6602, it is too old for that. Also adding more cartridges would take too much space. They are 3cm wide each. You would need 5 cartridges for a 3DP printer: Clear, Black, Cyan, Magenta and Yellow. So sadly no, it is not possible to simply add another cartridge. I am going to investigate a different printhead that does have all the required functions for full colour printing, but that will require me to do a full hack, because there is no documentation whatsoever on that one. That one also won’t be a feature for Plan B, it will be built on a new printer. You said that you were going to investigate in non resivour print heads, the ones that have a little tube going to them, that could be much more compact, and maby you could fit it on the printhead holder? You are correct, but those are still not narrow enough to fit on Plan B. Once I discovered that it would take 5 cartridges (which is just too much) I designed it to hold only 1. The toolhead width is 3cm max. Any more than that and the spreader would hit the printhead. The printhead I have in mind (hp cn642a) will not be narrow enough. Also the electronics on Plan B don’t have the calculatory power to handle more than 1 cartridge (it barely handles the C6602 at 60mm/s). Plan B is already at it’s limitation on just about every level. It can print, but it lacks the power to handle much more nozzles and speed. It also can not be heated with enough control and there are motors that could be removed in a future version. I learned unbelievably much from it but it will not be the 3DP revolution, it will just be a stepping stone. Plans are already being made for a better, cheaper and faster 3DP printer that does have support full colour. The only big improvements I will probably make (unless someone give me an idea for something important) are better printing materials, but that knowledge also migrates to a new printer. The hp cn642a may need a lot of work with a logic analyzer to get going, but without the plastic, it does’t ooh very big at all. Hi Ivo, I just want to thank you. Your project is great, we wrote an article on our site for our readers in France. I love what you’re working on. I have a Z Corp. 450 printer and I agree with you that the consumables are far too expensive. I discovered that the eBay seller of the third-party powder is an engineer located in Canada. He sells the powder, and you can see his site at Canada powder.com. I’m not connected with him, I talked to him on the phone and he sounds okay. I actually haven’t used his powder yet. I ordered the previous iteration, and haven’t got around to using it. I have an idea that takes your open source powder layering system. I own a Epilog laser, and I was thinking couldn’t it be adapted so that the two go together? There’s a new Kickstarter project, that’s supposed to be released in October, that does this concept. They are in Europe as well, sintratec.com, which will be doing exactly what I just wrote about. I looked at the Canadian manufacturer and while his powders seem great in their properties I still find it excessively expensive. It is a great addition to possible powder and binder suppliers though. He has already managed to make great prints. The thing that still intrigues me is High speed sintering (google it), using black ink and plastic powder with a IR heater to print parts. While my first research direction will be ceramic 3D printing, it is high on my list, due to the fact that it requires (hopefully) little modification. Any chance you would know the pattents in question? I do, Gladly, they put all their patents in their user manuals. 5204055, 5340656, 5387380, 6007318, 6375874, 5902441, 6416850, 6610429 and 6403002. The internet claims that US6007318 is the key patent and it expires in December 2016. I have taken a quick look at all of these patents and most of these actually are about copy pastes of each other, so I am not sure. The genesis of the name is GREAT–it tells a story (evolution from the Focus project), and that gives the product personality at first blush. *I* walk away with “Well, a 3D Systems printer is a $40k Plan A, this is a $2k Plan B” Great work, if I had few grand laying around I’d start building one! Have you looked at kickstarting a production run? I’d drop a dollar in the tip jar for all your hard work! While trademark will not be a problem for me selling Plan B, Patents are a bit more of an issue. Starting a kickstarter now would mean the same issues the Form 1 had. I would need to settle with 3D systems on a license. Also with the current design, quantity hardly brings down cost. It would have to be designed around manufacturing. So any kickstarter is still at least months, maybe a year or two away, if it happens at all. Not to mention Plan B still needing more improvements. I’d consider it, but not right now. Zag je verhaal op Techcrunch en bewonder je initiatief. Lijkt me leuk om eens contact te leggen. I am fully well aware what Plan B ALSO means. I was aware way, WAY before I even thought of posting it and honestly I don’t care, I like the name, because I know how it came to get this name. Plan B also means dozens of other things. Changing it is not going to happen, not under any circumstance. I don’t think you fully understand how trademarking works and what the goal of plan B is. But thanks for pointing it out and the compliment at the end. How sturdy / tough are the 3D printed object, in comparison with say ABS 3D printed parts? I will post a video of me trying to destroy print in a later future (within a month-ish?). I will try and load a dumbbell weights on a part I printed so far and make a picture of it, so you can at least get an idea. Just for the information. Parts are quite strong, None of the parts can be broken by hand. While I don’t know about impact strength, static strength is fairly good (on the same level as PLA or ABS). Infiltrating with better glue (like epoxy) will make the parts even stronger. But more information on this subject will follow in the future. There’re many thought-provoking in Improvement and future printers section. I really like your vision about SHS, this machine got so many material possibilities waiting to be explore, gypsum, ceramic, polymers, metals and anything powder. Glad to see your project come to life. I’ve been following your work since you first released the Focus. I started on a design for my own 3DP machine based off Focus since. Hopefully releasing it in the next month or so. Shoot me an email when you get a chance, I’d like to chat with you more in depth about some of your future ideas as they align with a lot of my own interests.